Greyhounds are incredibly fast and aristocratic, graceful and elegant. They are intelligent, docile, placid dogs that like to just lounge around the house, making them an ideal house pet. The Greyhound is an ancient breed that originated in the Middle East and North Africa and has won the admiration of many different cultures. Greyhounds have been depicted by the Greeks and in Egypt , the favorite hounds of the upper class were mummified and buried with their owners. The walls of Egyptian tombs often were decorated with images of their hounds. Greyhounds found their way into Europe during the Dark Ages. They were so respected for their hunting prowess that the laws of the time protected royal game reserves by forbidding anyone living within 10 miles of the king's forests from owning a Greyhound. The value of a Greyhound exceeded that of a serf, and the punishment for causing death of a Greyhound was equivalent to the punishment for murder. The Greyhound was used as an emblem, often in tombs, at the feet of the effigies of gentlemen, symbolizing the knightly virtues (faith), occupations (hunting) and generally the aristocratic way of life. The US cavalry used Greyhounds as scouts to help spot Native Americans, since the Greyhounds were fast enough to keep up with the horses. 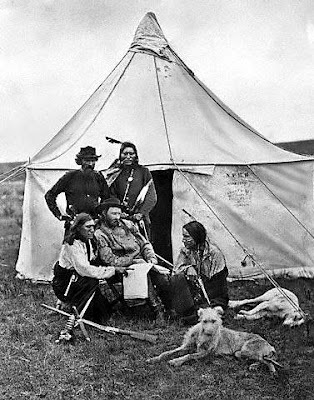 General Custer, General George Custer reportedly always took his 22 coursing greyhounds with him when he travelled and even raced his dogs the day before he set off on his fateful trip to Little Big Horn. The patronage of the two queens led to Greyhound racing being dubbed the "Sport of Queens." Greyhounds are bred for strictly racing. They have a long neck and head, small ears usually folded back but erect when attentive. The back is long and muscular with an arch over the loin, deep chest and narrow waist giving the greyhound its distinctive silhouette. Their legs are long and powerful and their feet have well knuckled toes. Greyhound tails are long and curved and are usually kept down. Greyhounds have thin skin, a light coat and little body fat. They come in a huge variety of colours including fawn, black, red, blue, gray, or white and various shades of brindle. Greyhounds are gentle, affectionate, trusting, intelligent, good natured and friendly. Having been bred to hunt, race and live together without fighting, they are generally well socialised with other large dogs but need to be assessed for sociability with small dogs (particularly fluffy ones) due to instinct and training. Some Greyhounds are cat tolerant and can live harmoniously with other animals. They do not make good guard dogs as they tend not to bark much and don’t get overly protective of property. Greyhounds are very clean dogs and are almost cat-like in their grooming routine. They have very little odour, shed little and only need to be bathed occasionally. 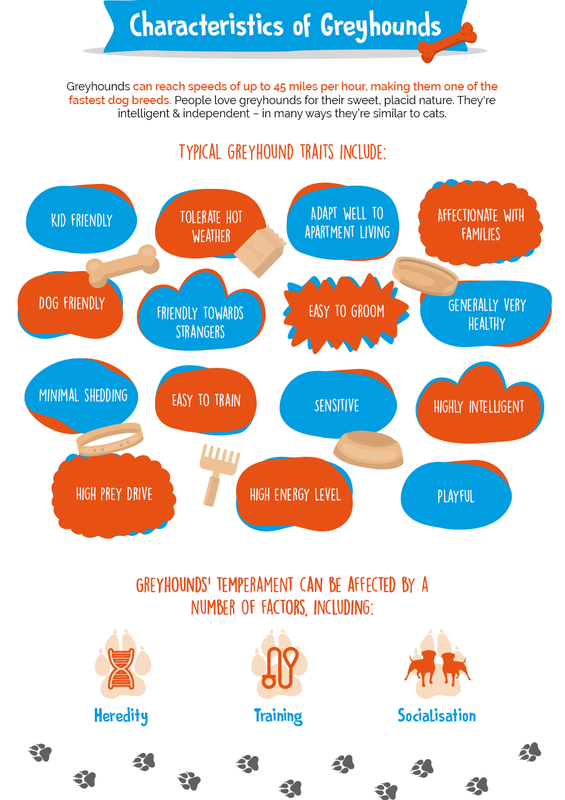 Having no undercoat, greyhounds are less likely to trigger people's dog allergies than other breeds with more hair. Greyhounds are sprinters and exert great bursts of speed over short distances. They tire very quickly and are not suited to pursuits that require endurance. Greyhounds have a unique double suspension gallop, more cat-like than dog or horse-like. This means there are two periods when all four feet are off the ground. This gait assists speed. As a housepet they require no more exercise than any other breed of dog and short daily walks will keep them healthy. They are generally very lazy and like to sleep up to 20 hours a day if given the chance – they need to conserve their energy for that explosive rush of speed that pet greyhound owners like to call "zoomies"! The Greyhound is a strong, muscular dog, built for sprinting over short distances. In fact, with the exception of the cheetah, the Greyhound is the fastest creature on earth. 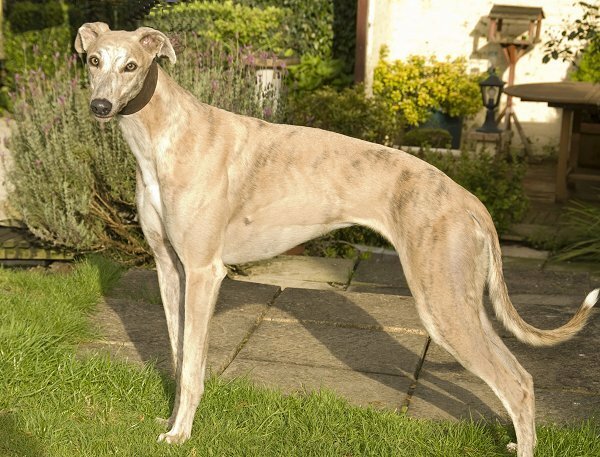 The breed belongs to the sighthound family, which includes Afghans, Borzoi, Salukis, Deerhounds, Irish Wolfhounds, Pharaoh Hounds, Whippets etc. Greyhounds run and hunt using their sight (60%), sense of smell (20%) and hearing (20%). Other dogs use their senses differently depending on what they were bred to do. Greyhounds have a larger heart and higher blood pressure than other breeds of dog. Their blood is extra rich in oxygen carrying red blood cells and they have about 4% more blood than other dogs. 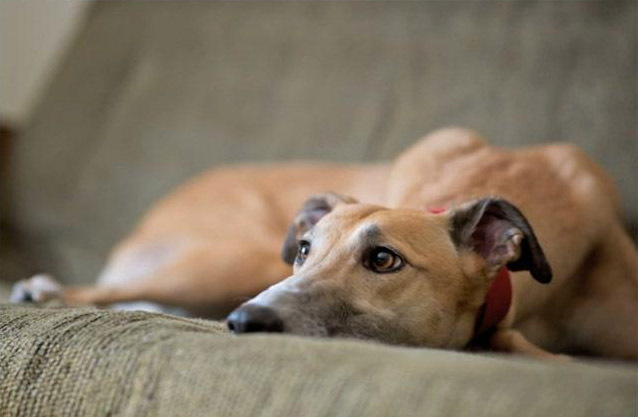 The special qualities of their blood makes Greyhounds highly valued as canine blood donors. Their body weight is made up of 16% fat which is less than half the amount of other dog breeds of similar size. This means they don’t cope well with extreme temperatures. 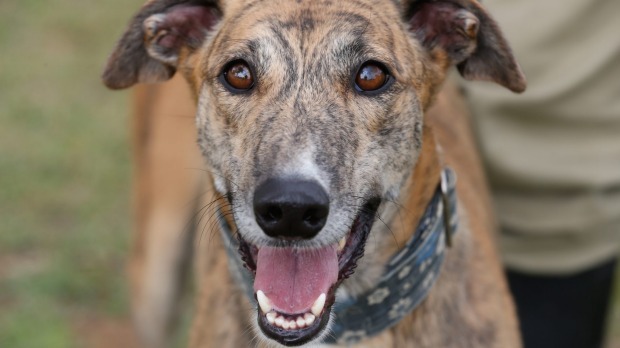 Due to centuries of selective breeding, Greyhounds have very few inherited health conditions.The most common breed ailments are digestion related and they can be prone to some forms of bone cancer. Some Greyhounds can be fussy eaters and they are generally not prone to overeating and becoming overweight. They can have sensitivity to certain drugs (including some flea treatments) and anaesthetics. The average lifespan for Greyhounds as pets is twelve to fourteen years, and they are a breed which truly grows old gracefully. 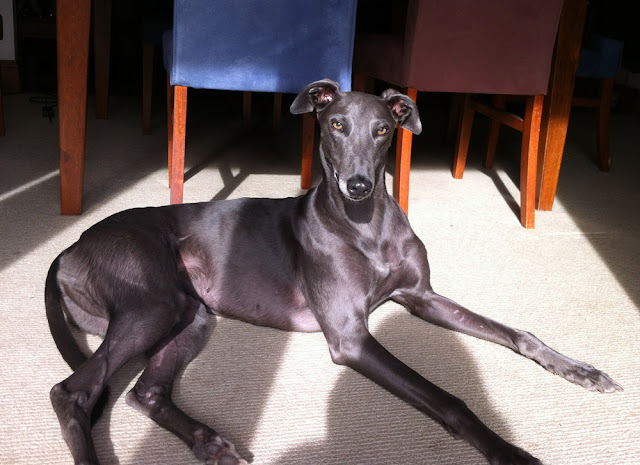 The Greyhound combines a stately appearance with a friendly attitude toward people and other dogs. Loyal and affectionate with his family, he's not aggressive toward strangers, although he will let you know — through a bark or a subtle pricking of his small, folded ears — that someone's approaching your home. Greyhounds have a reputation for high energy levels, but in reality their favourite pastime is sleeping. Designed as sprinters, not distance runners, they'll be satisfied with a daily walk, although active people find they make good jogging or running partners. Greyhounds are wonderful dogs in flats or apartments. They are clean non-smelly dogs who rarely bark, sleep a lot, require little exercise and don't shed much. Many Greyhounds while racing never experience other dog breeds or small animals such as cats or guinea pigs. As they have been bred as hunters for centuries, the instinct to chase is very strong in some dogs. Most Greyhounds are very sociable and will mix readily with other dogs if introduced correctly. Some retired dogs will get along well with cats; others are too 'keen' to live successfully with them. Generally, Greyhounds are very gentle with children, preferring to walk away from a pestering child; however, young children (especially under-fives) should never be left to play unsupervised with a dog of any breed. According to a law introduced in Australia in 1927, Greyhounds must always wear a muzzle when in a public place (with the exception of Victoria). 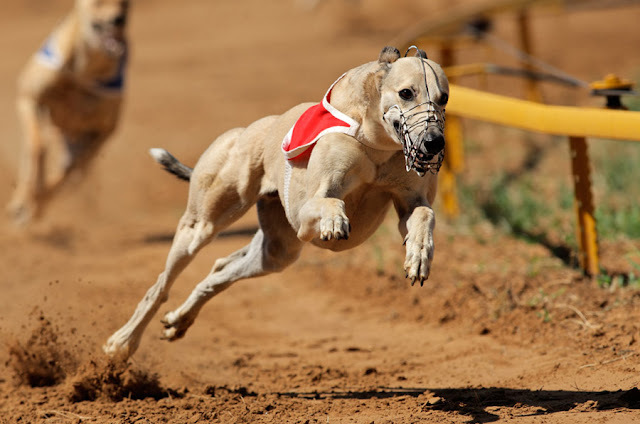 Initially the muzzle was introduced on the race track to prevent the dogs from injuring themselves during the general excitement at the track and their high spirited racing. Retirement for Greyhounds comes around usually before they turn 5 years old but unfortunately, many of these dogs will be destroyed. Only a small percentage will go to stud, race overseas or retire with their owner and many end up in rescue shelters. Did you know that in Homer’s Odyssey, the only one to recognise Odysseus upon his return was his Greyhound Argus?